Here we can see my ancestor (perhaps, it’s not easy to be sure), Robert Ewing, in the townland of Ballymackilroy in the parish of Errigal Keerogue in County Tyrone. We can see who Robert pays the rent to – Sir John M. Stewart, Baronet – his 8 acres, 3 roods and 5 perches of land, and how much was payable in rates. The ‘numbers and letters of reference to the maps’ allow you to see exactly where on the field map the property is. The maps have also been published online. Part of the Griffith’s Valuation map for Green Hills, County Tyrone, showing Ballymackilroy townland. 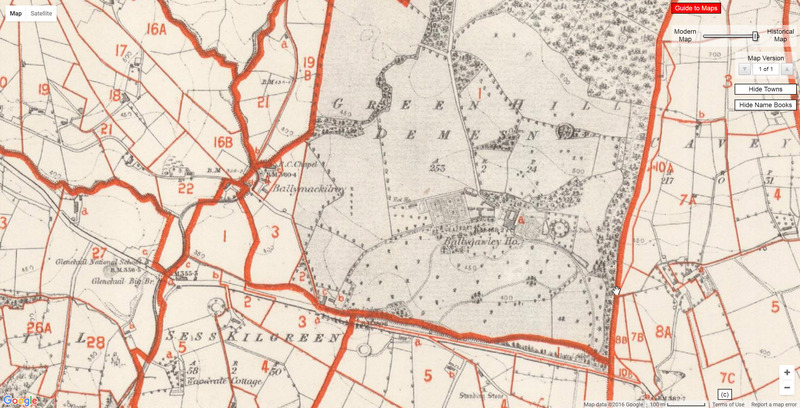 To the left of Green Hill Demesne in the number 21 in red, above Ballymackilroy – that’s Robert’s land. A quick Google search confirms my suspicion that Robert’s landlord, Sir John Stewart, was the owner of Ballygawley House in the middle of Green Hill Demesne. The Field Books, House Books and various other books were the handwritten records of the valuers as they travelled around the country, and can contain their own descriptions, drawings and other information. It is important to know what year the book for your area was published, and here is why: When Griffith and his team was travelling around the country valuing properties the rules changed a couple of times, and properties that were initially exempt from tax as being below the tax threshold had to be revisited. For the northern counties, which were visited first and then had to be re-visited, there may be two field books. These can be compared – the Great Famine came in between and many families had moved or died. 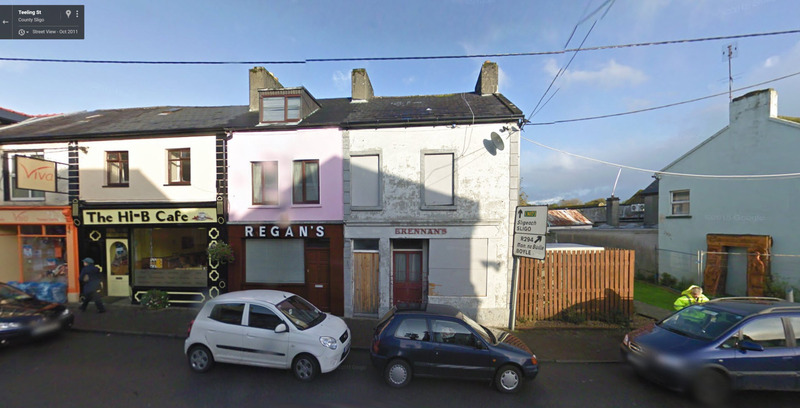 Here is the entry for widow Anne O’Neill in Tobercurry, County Sligo. Valuation Field Book for Tobercurry, Sligo, July 1856, showing Ann O’Neill. The numbers of the entries correspond to the numbers on the plan at left. All of this research can now be done from home at Ask About Ireland, adding so much to your understanding of the lives of your Irish ancestors. See the section of Griffith’s Valuation searches and records to find the records, and explanations of what the records are and what they mean. Today (3 July 2016) marks 100 years since the death in France of Otha Everleigh Bassett, Keith’s great-uncle. Otha was a country lad, a share farmer from Condobolin in the very centre of New South Wales; he was 5 feet 11 inches tall with a dark complexion, grey eyes and black hair. When he enlisted in Condobolin on 11 May 1915 he was 24 years and 7 months, and gave his father Alfred Bassett as his next of kin. He was shipped out of Sydney on the Orsova on 14 July 1915, and ‘taken on strength’ on 5 September 1915, joining a composite company attached to the 9th Battalion in Gallipoli as a temporary Corporal before joining the 3rd Battalion. After the evacuation from Gallipoli and training in Egypt he was sent to France in late March 1916. On 16 June 1916 he wrote a letter home from France to his brother Percy in Condobolin, just over two weeks before his death. The letter was published in The Lachlander on Wednesday, August 23, 1916. Dear Brother,— I have just received your letter of 17th. May and I was pleased to hear from you, and to know that things are all right. The last I got from you was about two months ago. No, I have not been knocked yet though I may be before morning, for all I know. I can hear the guns roaring, and one might hit just here any minute, but I hope it doesn’t bother though. They throw a lot of iron rations about at times, issue them out pretty freely. It is mid-summer here now, and, about as hot as it is in winter in N.S.W. The days are very long, there are only five hours darkness. It is nearly always raining here and seems to be good seasons. There is grass, wheat, and oats near the firing line (where there is no stock) three and four feet high around old broken up farm houses, which are all brick with tiled and thatched roofs. I am known in the company as tiny, the hun, the wirer. I have been putting out barbed-wire entanglements between the two firing lines at night which is not a very safe game, a couple of my mates were wounded pretty badly one night, I could tell you dozens of exciting personal experiences I have had, but they seem a bit too shaky, so I will leave them untold, in the hope that I get back to tell them. I was nearly trapped by the huns once, that is why they call me the hun, they say I go out and have a yarn with them at night. This is a fine place, a great pity to see a war here breaking it up. I have seen places blown to pieces in less than two seconds. Buildings as big as Tasker’s Royal Hotel, Condo, about five or six high explosive shells drop on it at the same instant, and everything is down on the ground in a heap of debris. There is very fierce fighting going on in places at present. One that has not been here could not imagine what it is like, and it is more than I dare write about for it is not in the agreement. I suppose things are much in the same boat with the Germans by the number of shells that our artillery send over to them free of charge, they never say if they get them or not, but I expect they get some of them safely enough. I saw a few letters in the “Lachlander” by Percy Shephard. Remember me to the folks at home. Otha was killed in action on 3 July 1916, and is buried in the Rue-David Military Cemetery in Fleurbaix, a village about 5 kilometres south-west of Armentieres. Go to the Historical Land Records Viewer (HLRV) at images.maps.nsw.gov.au. You will have to accept the terms and conditions before you will be allowed in. The Purchasers Indexes are first, followed by the Vendors Indexes. They are not necessarily in date order. Find the date range you want and click on it. You will be shown the first page. You can page through one at a time to find the name you are looking for, or you can use the drop-down to ump pages. There may only be a few pages, as in this example, or there may be hundreds of pages. There is no way to jump straight to a name, you have to scroll through the pages, as you would with the pages of the original volume. The names may not be in strict alphabetical order, particularly in the early years, so you must check every page. The Reference Book and No refer to the original deed. The deeds are being slowly digitised, and the books are gradually being removed from the shelves at the Lands Office in Queens Square. If you want a copy of the deed you will have to purchase it. The Volume and Folio in the last two columns refer to the title. You can also see the Old Form Torrens Titles in the HLRV. Later volumes are not available, so just try the one you want and see if it comes up. Use the attribute Vol-Fol (Volume and Folio, separated by a dash). Use the same page control to see the other side of the title with the transactions. Very early titles may have four pages – the black and white microfilm images, and the recent colour images. Some knowledge of the gold rushes in the nineteenth century can help us understand aspects of our families’ history that we’d been missing. It is difficult for us now to imagine the enormous pull that a gold rush had on people, the chance that a fortune could be made so quickly, and so we may not consider that our ancestors took part. This knowledge would have helped me enormously when I was first researching my Stewart family. My grandmother was very proud of her father, William Stewart, an architect and inventor who lived in Albury, New South Wales, for most of his life. He married Sarah Louisa Craig Lowe of Auckland, New Zealand, and they had seven children, all born in Albury. William’s father was Peter Hannah Stewart, a Scottish immigrant from Oban, Argyllshire, who arrived in Victoria in 1855. 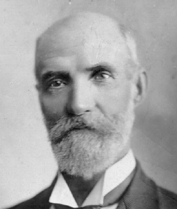 He married another Scottish immigrant, Grace Simpson, in Albury in 1863. At the time I didn’t question why he would have come in to the colony through Melbourne rather than Sydney. I just figured that Albury is closer to Melbourne than it is to Sydney. As I said, I was new to family history research. I found that the Stewarts were the only branch of my family tree that paid their own way to Australia; all the others were assisted immigrants. This fit in with my grandmother’s attitude that she had married beneath her, and I thought no more about it for years. The eldest child was born in Albury in 1865 but I couldn’t find William until I looked in Victoria. Peter was a farmer in Barnawartha, between Chiltern and the Murray River. There were no farmers in his background: his father was a cooper; his maternal grandfather was a tailor and cloth merchant; and his father-in-law had been a flax dresser. William’s younger siblings were also born in Barnawartha. It was when I started looking at Peter’s siblings that the truth started to emerge, if only I’d been able to see it. 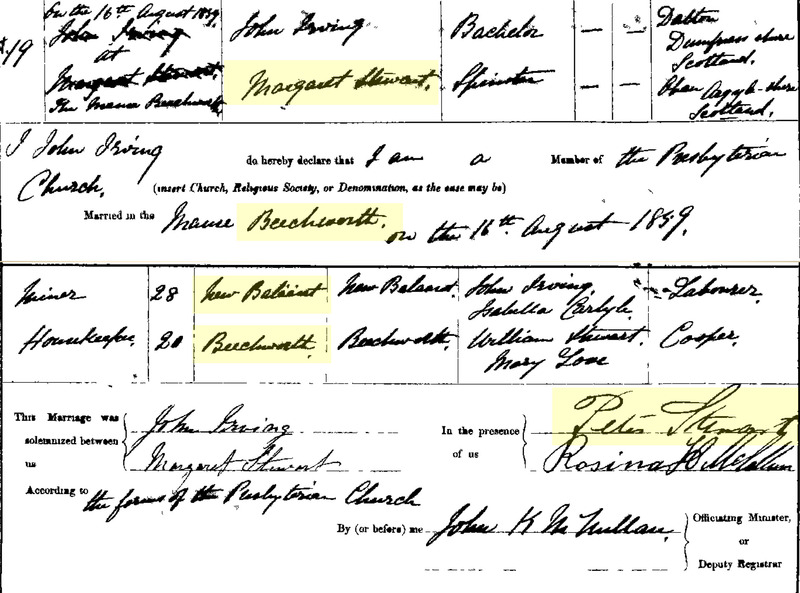 Peter’s younger sister Margaret Stewart married John Carlyle Irving in 1859 in Beechworth, Victoria. Peter, still unmarried at this time, was one of the witnesses. My knowledge of Victorian towns was not what it is now, and at the time the name ‘Beechworth’ didn’t mean anything to me. I then made the mistake that many new researchers make, and I didn’t look into Margaret any further, as I was only interested in Peter. John and Margaret had two sons in Ballarat before migrating to Invercargill, New Zealand, in the early 1860s, where six more children were born. Why Invercargill, at the bottom end of New Zealand? I didn’t know. Peter had an older brother, Hugh, a cooper like his father. Hugh arrived in Victoria from Scotland in February 1855 aboard the James Baines with his new wife, Elizabeth, months before his younger brother Peter. Hugh and Elizabeth also settled in Albury, New South Wales, becoming a well-respected member of the community. His obituary in the local paper mentions some time in America. America? Hugh, as I discovered, was the first to arrive in Victoria, I found more information in a book in the local history collection of the Albury Library. Hugh went to New York and was working there as a cooper when the Californian gold rush started. He went to California, and then to Victoria when the gold rush started in 1851. This was news to me! Apparently he went back to Scotland for a year, got married, and brought his wife back to Victoria, although whether he worked as a cooper or as a miner, I’ll never know. The waves of gold seekers moved around the continent; into New South Wales and Victoria in the 1850s; across to New Zealand in the 1860s; to Queensland in the 1870s and Far North Queensland in the 1880s; across the Top End into the Northern Territory and the Kimberley in Western Australia in the late 1880s, and down to Kalgoorlie in the 1890s. The chain of gold discoveries was self-perpetuating. The best chance for individual miners to strike it rich was to get there early and harvest the easy pickings off the ground. As the alluvial gold ran out in one place these miners moved on, and now they knew what to look for. As gold was found elsewhere the miners were lured to the next gold field, and the next, and the next. Others stayed behind to dig the gold out of the ground, and formed partnerships or became employees of newly-formed mining companies. The largest and richest gold fields were the most attractive, particularly Victoria in the 1850s and Western Australia in the 1890s. The longer the rush continued the more tempting it was to pack up and go. People who had never worked as miners before travelled hundreds of miles to strike it rich. Many had never even worked outdoors before. Others saw opportunities in catering to the miners – stores, equipment, alcohol, entertainment, transport. Most didn’t stay. They left the mines and became farmers or shopkeepers, settling down with wives and children, on properties of their own. I can now see my Stewart family with new eyes. I know about places like Beechworth and Chiltern, and I can guess why Peter Hannah Stewart came to Victoria when he did. Peter was said to have been a carpenter when he was a young man, and he went back to carpentry in Albury when the farming didn’t work out in Victoria. I imagine there was plenty of work for a carpenter in the new gold field settlements, as shops and houses were being built. If your ancestor went missing, or seemed to move around a bit, or if any of the gold rush placenames ring any bells, then perhaps they were chasing the California Dream of striking it rich on the goldfields, as Hugh Stewart, the cooper from Argyll, Scotland, did. Geoffrey Blainey, The Rush that Never Ended, Melbourne University Press, 1978. Beatrice Brooks and Lorraine Purcell, Golden Journeys, Visits to the Western Goldfields of New South Wales, 1852-1859, Hill End & Tambaroora Gathering Group, 2012. Kerrin Cook and Daniel Garvey, The Glint of Gold, A history and tourist guide of the gold fields of the Central West of New South Wales, Genlin Investments, 1999. Shauna Hicks, Tracing Mining Ancestors, Unlock The Past, 2014. David Hill, The Gold Rush, William Heinemann, 2010. Geoff Hocking, Gold, A Pictorial History of the Australian Goldrush, The Five Mile Press, 2006. Nancy Keesing (editor), History of the Australian Gold Rushes, by those who were there, Angus and Robertson, 1967. Ian MacFarlane, Eureka, from the official records, The story of the Ballarat Riots of 1854, and the Eureka Stockade, from the Official Documents of the Public Record Office of Victoria, Public Record Office of Victoria, 1995. Dorothy Wickham, Family History Research in the Central Goldfields of Victoria, Ballarat Heritage Services, 2004. Also look for local histories of goldmining districts and contemporary accounts of individual golddiggers.